The 3rd United States Infantry Regiment, The Old Guard, is easily identified by most people as the military unit that conducts all official ceremonies, special events for the United States Army, funerals into Arlington Cemetery, as well as providing honors to our nation’s fallen soldiers. On September 11, 2001, much of the unit’s focus changed, evidenced by their participation in the search and rescue operation immediately following the terrorist attack on the Pentagon. The Old Guard recently deployed an Infantry Company to the Horn of Africa for the second time during their long and distinguished history in support of the global war on terrorism. B.J. 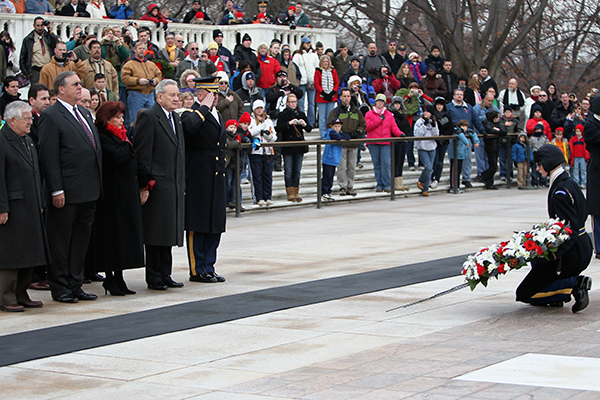 Mungenast was honored to be chosen to lay the wreath on the Tomb of the Unknown Soldier in Washington, D.C.